Your mind thinks and thinks …and the more you are thinking, the less aware you are. The more you are thinking, the more confused you are. From that place of confusion, life becomes a fantasy or a nightmare. In any case, you are not connected and it does not work. In life we always have the choice. We can choose our mind as our guide and live in worries and doubt or we can choose our soul and be more vibrant. It is up to us. What can we do to say yes to life? This year is the year of the number seven in numerology (simply add 2+0+1+4). 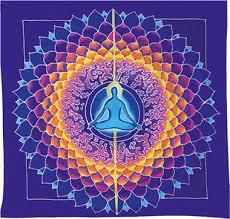 The seventh body corresponds to the auric body in the Kundalini Yoga tradition. This body influences your self-esteem and your power to attract what you want in life. It affects your intuition and is directly connected to your immune system. How can we strengthen our auric body? There is one thing that will help you shift quickly and step into your life with truth and radiance; one thing that will put you out of your habitual way of thinking and reacting, one thing that will help your auric field to be brighter, bigger and stronger. This is your breath. If you want to change any aspect of your life, change how you are breathing. Your breath is your spiritual blue print. The yogis have believed that you can change anything through breath: your white and red cells count, your destiny, your addictions, etc. There is a breath pattern for everything. There are many spiritual traditions that offer breath patterns in their toolbox. If you want fast shifts this is it! Step into your life and commit to a three minutes breath every day!